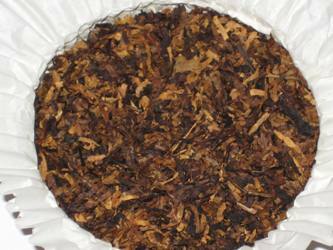 A part of the Virginia tobacco is steamed in order to get the smooth taste. Because the recipes of the Dunhill Pipe Tobacco Blends are kept secret, I could not find out how much Latakia that they put in this blend. I presume that it is not very much because the Latakia is not very strong like I encounter in most every other Latakia/English type blend. However, with this new information taken into account; I still stand by my review of this blend, with the obvious exception that it does contain Latakia. It does not change the fact of what I thought about the flavor and aroma of this blend. It is still a really good blend. The tin aroma of this blend is a nice tobacco smell that is a little earthy with some sweetness to it. I am also picking up on hints of smokiness with some spice. On the first smell, it kind of smells like there is Latakia in it from the smokiness. But upon further and deeper smelling, I am no longer really picking up on Latakia. The smokiness faded quite a bit and was replaced by a more predominate aroma of tobacco. I am not sure if this blend contains any Latakia in it or not, but I do not think that there is. I would guess that the reason for the first smell of it is that Latakia is made from Oriental tobaccos and I was picking up on the base aroma of it. The moisture is good for smoking right away, but some others might find that drying it a bit will be helpful. I loaded up my pipe and proceeded to the charring light. Flavor: I picked up on some nice tobacco flavor with some sweet and spicy notes and a very slight hint of some smokiness. Aroma: I smelled a nice tobacco aroma with some spice, sweetness, and a hint of smokiness. The smokiness that I detected during the charring light was different than the smokiness that I get from most Latakia blends. 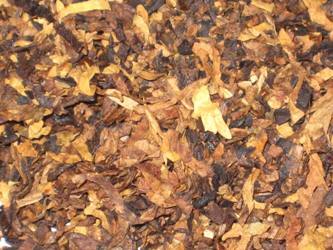 The only way that I can describe it in this blend is; a lighter, cleaner, natural smokiness. It was not as heavy as most blends with Latakia. I finished lighting up the pipe and settled in for the smoke. Right at the start, the flavor is a nice tobacco flavor with a bit of spice to it and a nice backbone of sweetness. As the bowl progressed, the sweetness kept moving a little more forward to balance out the spice that I tasted. The very light smokiness is still present in the flavor and aroma. It does not remind me at all of the flavor and aroma of Latakia that I encounter in most blends that contain it. I really don’t know how to explain it, but it is very pleasant. The flavor doesn’t really change too much during the smoke. Sometimes it is a little more sweet than spicy and sometimes it is a little more spicy than sweet. The flavor profile stayed the same from start to finish. This is a really good blend. It smoked cool, dry, and didn’t bite (although I felt that if pushed it could) and has a nice flavor profile. While this blend is called Early Morning Pipe and in the description it says “Great as the `first pipe` arousing the palate for the further pleasures of the day.”; I think that this blend has enough body that it could be an all day smoke for a lot of people. If you like Virginia/Oriental blends, I think that you will really enjoy this. I Highly Recommend it. Description: Sweet Oriental carefully blended with Bright and Red Virginias, pressed and lightly stoved. 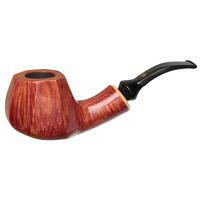 Great as the `first pipe` arousing the palate for the further pleasures of the day. 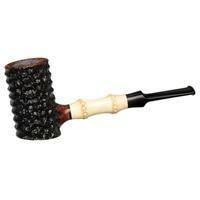 Dunhill Early Morning Pipe - Click Here to Order Now! I’ve never smoked this blend, but have often been tempted to try it. Now that the new iteration of Dunhills is available I’ll probably give it a go. It sounds like the red Va’s might be producing the vaguely smokey taste. I’ve encountered that same thing in other blends where the only possible culprit was a stoved red Va. But here I get the impression that the entire blend has been stoved — not just the red Va’s. Two questions: is there any vitamin N? and does this produce a nice volume of smoke when being puffed? In the vitamin N department; I would say that it is on the low to mid range of it, but I am a bad judge of it as I can smoke blends that are high and I really don’t notice the N hit. As far as a nice volume of smoke; it is pretty decent and holds in own in that dept. Great review Bob. Looks like another addition to my TAD list. Thanks for a great, interesting review Bob. I have been smoking this for a while now, on and off, and without really paying attention to what EMP is made up of, I would have swore it had Latakia in it. The smokiness is definitely there. That is very interesting that Latakia is not in the blend. And to Cortez’ question, 1) I got a high volume of smoke, yes. 2) No on the vitamin N. I can smoke EMP all day and not get a buzz. I am a lightweight as far as nicotine. There was some discussion in the forums about where EMP is made. It is made by Orlik in Denmark. I think Denmark has a negative connotation for some people, but EMP is excellent tobacco. Please allow me to put on my marketing hat for a minute. 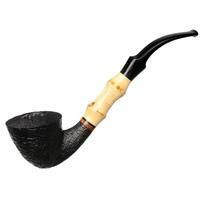 Manufactured in the EU under the authority of Dunhill Tobacco of London Limited, 1A St. James, London SW 1A 1EF. My personal belief is that this wording gives the consumer a higher level of comfort that the tobacco is of the high quality that can be expected from the decades old reputation going back to the origins of Alfred Dunhill. - “London” alone connotes a high level of quality, and is where Dunhill started. - “under the authority of Dunhill” - provides an extra layer of credibility that this is the real deal - the tobacco of legend. - “Manufactured in the EU” - is a nice way of saying it isn’t really made in England anymore, but we don’t want to use the word Denmark, since that may conjure up thoughts of some of the Danish aromatics that have given tobacco made in Denmark a bad name because they taste like cardboard and burn the heck out of your tongue. The Orlik factory is huge and they probably make many blends that you enjoy and have no idea that they make them. The latest production of Dunhil, which is what Bob and I have, is excellent. I am sorry to disagree with the reviewer. However, if this blend is supposed to be like the original, it definitely does contain Latakia. That is what it says in earlier Dunhil literature. For example, look here for a description. Did they change the recipe to eliminate the Latakia? I hope not, but I wonder. Thanks for the information. Based off of that, it seems that there might be some Latakia in this blend. I could not find any info about about whether there was any in it or not. I just went off of the blend description and the aroma of the tin and the smoke. If there is any Latakia in it, it is a small amount just to add some smokiness to it. When I first smoked this blend I thought there was some Latakia in it, but the smell of it dissipated very quickly and did not stand out. I will try to get some info from Orlik and try to find out for sure if it still contains Latakia. Once again, thanks for the info guys! I have received the information from Orlik and have corrected the error. You can read the editors note/correction at the top of the review. Thanks again guys for giving your thoughts and bringing my attention to it. Thanks for the compliment Cortez. I try to pick up on all of the tobacco components that are in a blend, but it is sometimes pretty tough to do with the way that some components can sometimes mimic other components. I may not get it 100% correct all of the time, but I will correct myself if I find out that I missed something. Well, I had concluded if there was no Latakia in this blend they must be using an essense of Latakia sprayed on the leaf much as a top dressing. Good to know they are using Cyprian leaf. I had a tin of this sent to me by Burley Claus. WOW…. I am a great fan of this blend. It is exactly what it says on the tin. It is light in Nicotine and mild as a babies soap. If I hadn’t had a tin of Nightcap to judge it against, I’d say this was the best English Blend I’d ever tasted. A very very good all day mild blend. I’d reccomend this to the Pope! The smell I got from this blend reminds me of burning rose cuttings, some awesome sunny balmy autumn (fall) Sunday afternoon smells. I’ve smoked this blend since the actual Dunhill production days, but mostly from the Murray’s iteration. A fine, factual review, Bob, and I agree with everything you wrote. This newest version from Orlick’s may need some aging time before it becomes as married and rounded as my older tins, but it shows both excellent potential to me and is already pretty darn good. A last comment slightly off-point: Of all of the reissued Dunhill blends, this is my second-favorite. I think they hit a three-run homer with the new London Mixture. I’d love to read a review on it! And btw - thanks for correcting the initial error about EMP not containing Latakia. It isn’t the main ingredient, but it’s very definitely there, and always has been. Even though I have some new favorite English blends, I still break out the EMP sometimes and remember why I like the stuff.